Boxes are secretive little things. 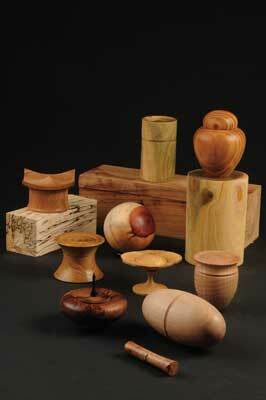 They are devised to hold items of value and importance and as such, can vary in shape, size and design considerably. I am inquisitive by nature and the choice of timber in combination with the shapes chosen have occupied many a turner for a lifetime - me included. In this article I have put together 10 end-grain shapes for you to grapple with. They are a logical progression in complexity and are sequenced accordingly. 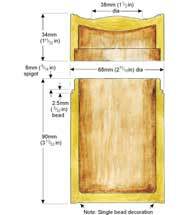 I am assuming knowledge on your part that you will understand the basic principles of turning boxes, using a spigot for the base and also the top to minimise grain misalignment, whilst also knowing how to hold the lid on either the base, via the friction method or, a jam chuck or a scroll chuck to remove and refine the lid to the end shape required. You will see that the article is divided into handy hints and tips that will help you with each project shown. If you can make these boxes then there is no shape outside of your reach or scope. 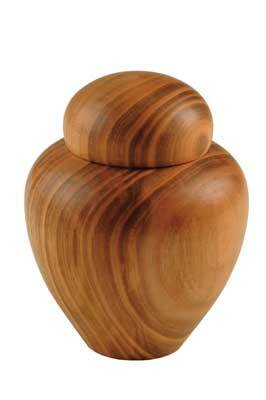 In one project I have used a separate contrasting piece of wood for a finial. Again, many designs can incorporate finials - look at the design, change aspects of it, sizes and design details and try and adapt them. 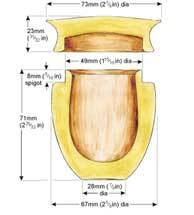 If you like the shape but it is too large or small, scale it up or down accordingly. I hope you have fun making these different designs. 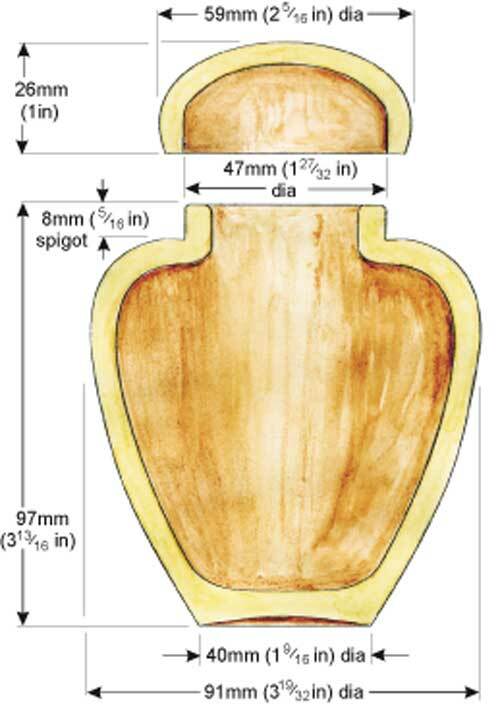 This cylinder-type box in lignum vitae (guaiacum officinale) can be made higher, shallower, wider etc. all of which have impact on the final shape chosen. The lid detailing provides much scope for you to personalise the box. Note the radiused corner details. It is not advisable to have sharp-angled corners which may get gummed up with muck, as they are likely to contaminate ring settings. The bead on the join line helps disguise any movement. If the joint was flush along the sides, distortion is very evident, should it occur. The micro beads are created by taking a 3mm (1/8in) parting tool and using the corner of a bench grinder which has been very slightly radiused to cut a groove in the end. This is then cleaned up to a full 'U' form with a rotary burr. 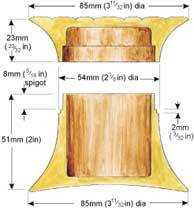 The bead produced will be between 2 and 2.5mm diameter and deep, depending on how you cut the groove. This tool is no longer suitable for use as a parting tool, but as a micro bead-forming tool it is excellent. This box in mulberry (Morus spp) has, in my opinion, more visual presence than the previous box. The sweep is a simple modification of a previous box, and it is by tweaking the shape a little that new styles are developed. The lid is easily gripped in the hand and there is a gentle friction fit between the lid and the base. The join is this time delineated by a small parting tool cut - again, to minimise any visual implications for wood movement. I do not think it affects the visual flow of the curve, however. 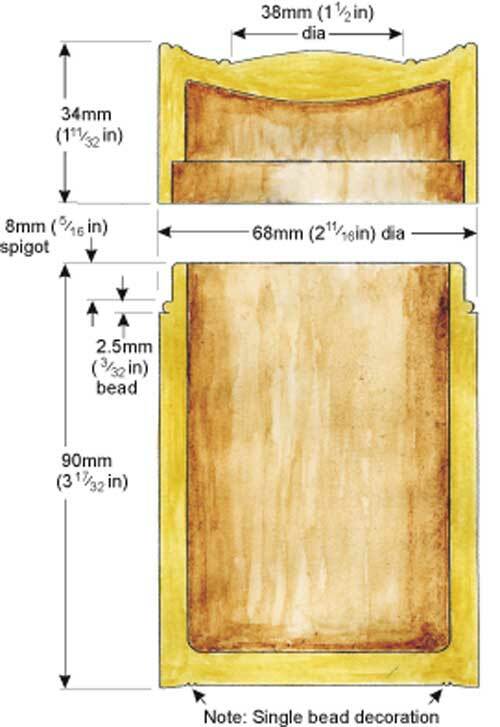 The beading on the top was cut with the spindle gouge ground to a fingernail profile. If you are having trouble creating uniform beads, then try adjusting them a little with a beading/parting tool used as a scraper. The finish is not so clean, but the cut is fine and easy to sand to a good finish. Be gentle with the sanding - if you are too over-aggressive, especially on the beads - you can flatten off the detail and diminish the effect. 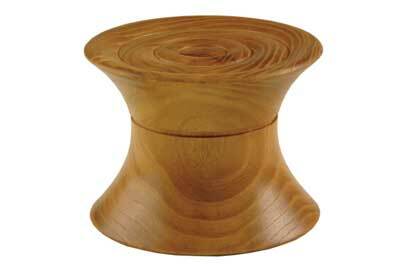 This box in rippled maple (Acer saccharum), is a hybrid of the two previous boxes. Can you see the progression? 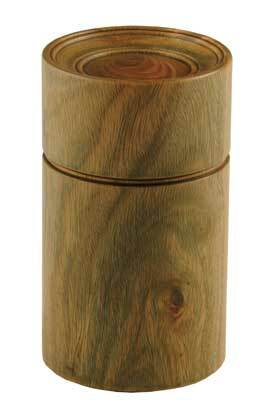 The cylinder is now a gentle curve and the lid is a version of the lid previously shown overleaf. The join is this time accentuated with a gentle undercut curve. Note: the grain misalignment is not that great, any that is there is partially obscured by the join. The internal form of this box is, I think, a wonderful one which allows you to slide out items such as rings and other similar pieces. Consider also a shape that does not mimic the external form. The contrast is a nice surprise when people open the box - try to challenge those preconceptions. Again, the lid is a gentle suction fit. Careful sanding is required on the gentle domed top so that it is one continuous curve with no ridging. Try using a medium density rubber pad as an interface for the abrasive to form the top. The more surface of the abrasive that is in contact with the work, the better the purity of form. I left the dome clear of too much detail, so the ripple figuring could be shown to its fullest extent, as you can see here. I have to say that this wood is an Australian burr, but as to which type, I have drawn a blank - no pun intended. It came in a mixed pack of Australian burr off-cuts suitable for small projects. This box is a needle case. The joint fit is tighter than the ones created earlier, but not so much so that you have to be Superman to open it. It needs to be a firm fit so that the lid does not come off accidentally. 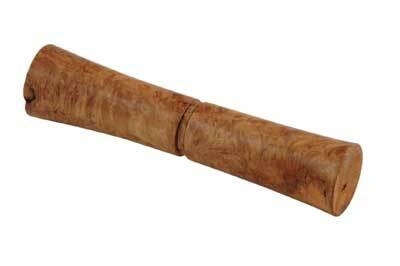 You could also consider thread chasing to create a different type of joint to the one shown here. Boxes do not have to be large and this is a practical project to house an item that all homes have, and because of the small size of the timber used, it is inexpensive to boot. The inside bore is not turned but is drilled. You could feed a small scraper down the inside should you choose to do so, but in my opinion this is not necessary. 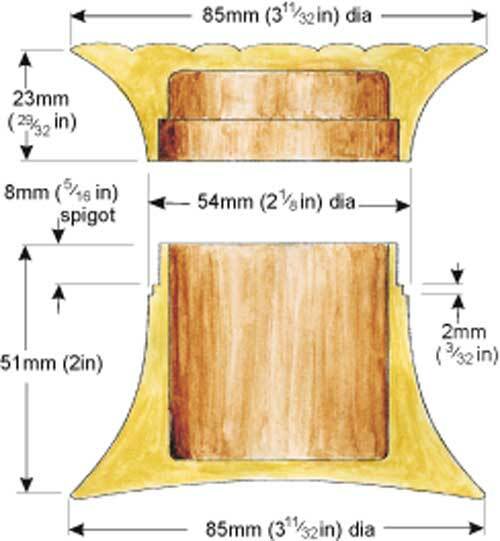 A twist drill is ideal to use on the inside: it will create a clean finish at the bottom of this dense timber and depending on make, will also create a clean bore as it cuts, thus minimising the need for sanding. 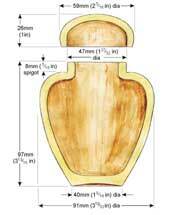 This Chinese-style ginger jar is one of my all time favourite shapes. It can be small or 3ft high - the proportions still work. And this means that it can be used for cookies if made large, or smalller for more personal items like rings and necklaces. The wood is European cherry (Prunus avium) and I think the pronounced colour and striped grain pattern adds a bit of drama to the piece. 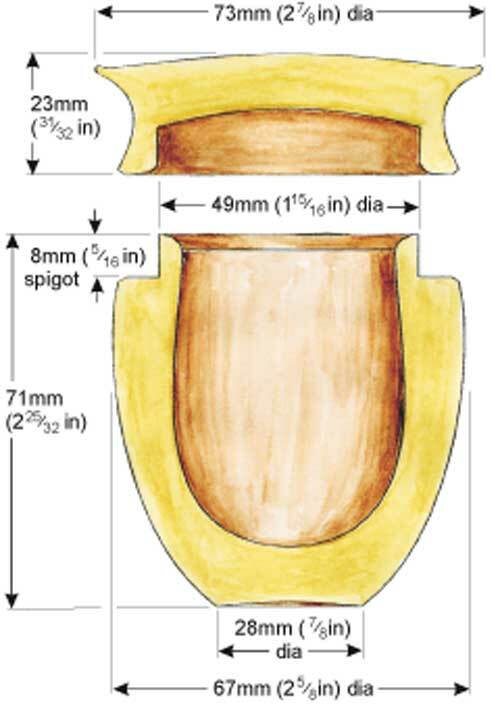 The big change with this project is that you will need to use an articulated or swan-necked hollowing tool to create the undercut - the shoulder of the piece. 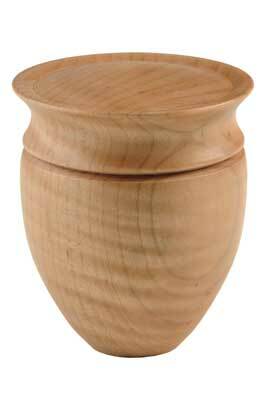 The lid is a soft fit - a slide over fit which enables the lid to be lifted off without holding on to the base. 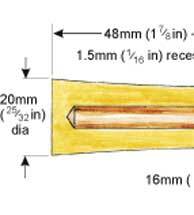 When using a swan-necked hollowing tool, remember to keep the straight section of the tool shank in contact with the rest. If you do not, the control point of the tool is shifted and is difficult to control. Make multiple light cuts when hollowing out and make sweeping refining cuts to clean up the surface prior to sanding. Sanding is done by hand, using abrasive wrapped around a stick.